A spectacular day of excellent smooth corn snow and stunning colorful solar halos on the ice-clad giant of the North Cascades. 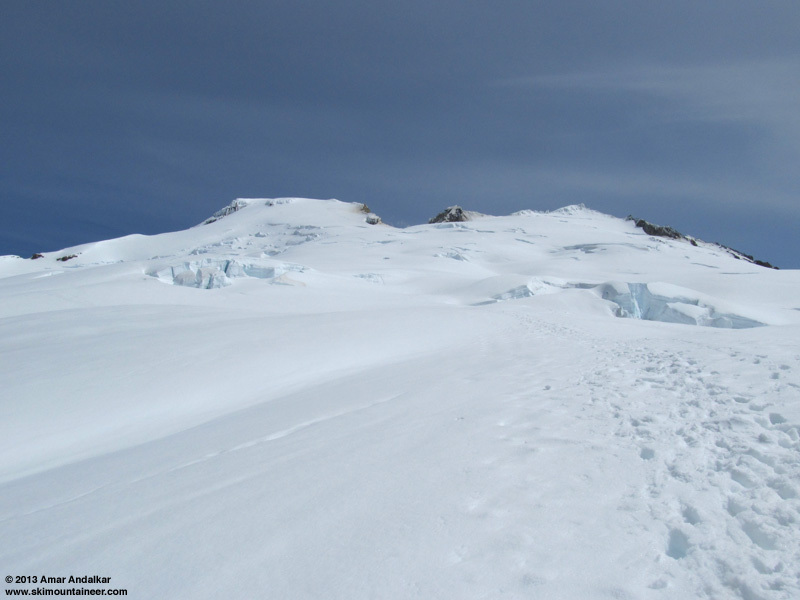 The Easton Glacier route currently offers almost 7500 vert of continuous snow from about 1/4 mile before the trailhead all the way to the summit of Mount Baker, with no snowmobiles anymore since the area was closed to snowmobiles after last weekend. 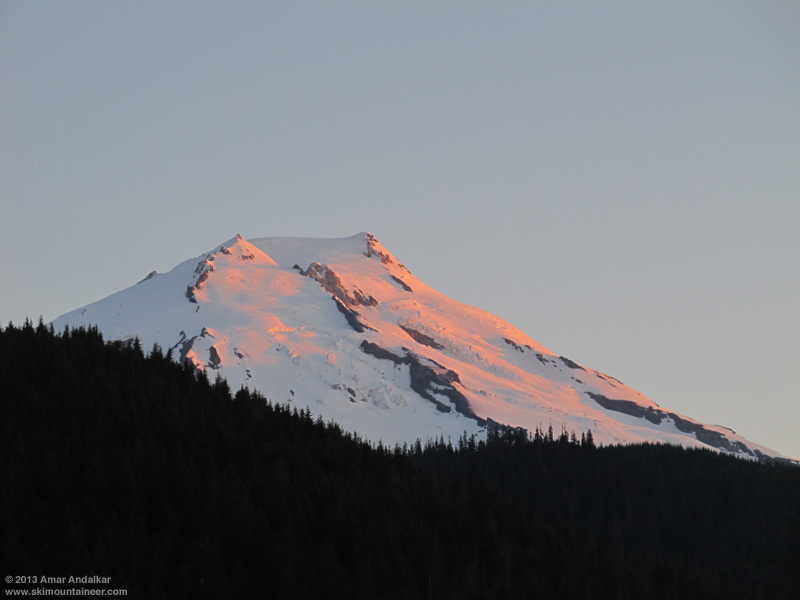 Sunrise glow on Mount Baker's Boulder and Talum Glaciers, viewed from the southeast. 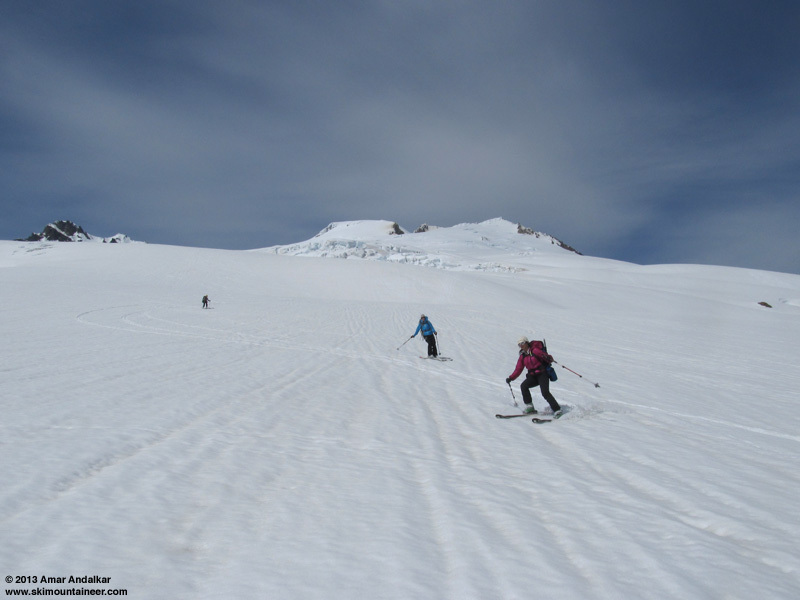 Saturday was forecast to be the single nicest sunny day between a pair of multiday upper-level low pressure systems, and skiing the south side of 10781 ft Mount Baker seemed like an ideal objective given the expected 10000 ft freezing level and light winds, S 10-15 mph at that elevation. Khanh, Alisa, Tobae and I drove up from the Seattle-Everett area the evening before and enjoyed a quiet night car-camping at the large deserted Sno-Park (also apparently a target range) just after the start of FR 12. We awoke to a spectacular sunrise on Baker and Shuksan at 5am, the earliest sunrise of the year occurring about a week prior to summer solstice. We ate breakfast and headed up the road to the trailhead, driving past dozens of cars lining the road and parking in a prime spot at the end where the road was blocked by snow at 3300 ft, just before the Mt Baker NRA sign. 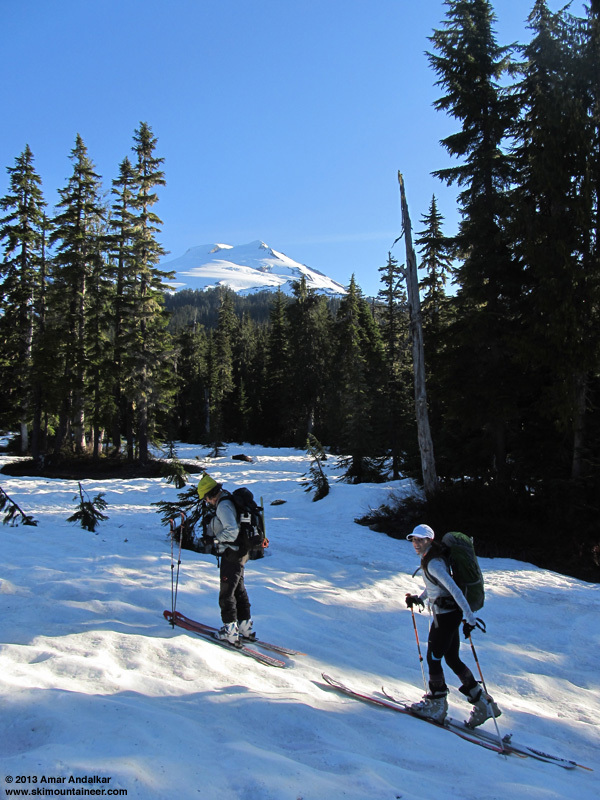 Skinning across Schriebers Meadow with Mount Baker rising beyond. We skinned from the car at 6:15am. Snowpack at the trailhead and in Schriebers Meadow is about 1-4 ft deep and quite continuous, but unfortunately along the normal route via the groomed winter trail up Rocky Creek, the snowpack becomes extremely patchy and discontinuous for a large area near 3800 ft. The best route currently is to avoid this entirely and follow the shallow stream gully just to the east, which still holds solidly continuous snow and rejoins the normal route near 4200 ft below Metcalfe Moraine. The snow was suncupped as usual at low elevations, but became quite smooth above 6500 ft after we ascended above the terminus of the Easton. 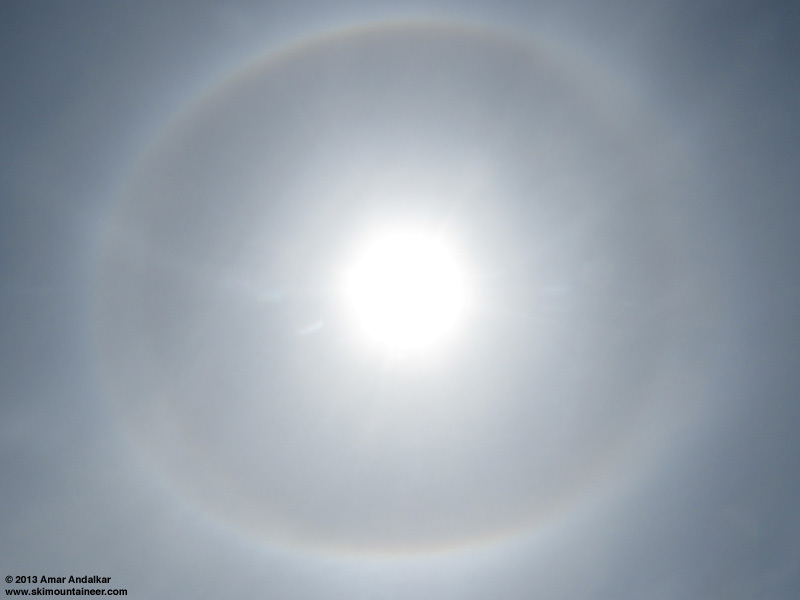 The UW model had predicted some high clouds moving through from mid-morning onward, and the cirrus arrived as expected, accompanied by the common 22� halo, at first in partial arcs around 9am and eventually forming a full circle around the sun. 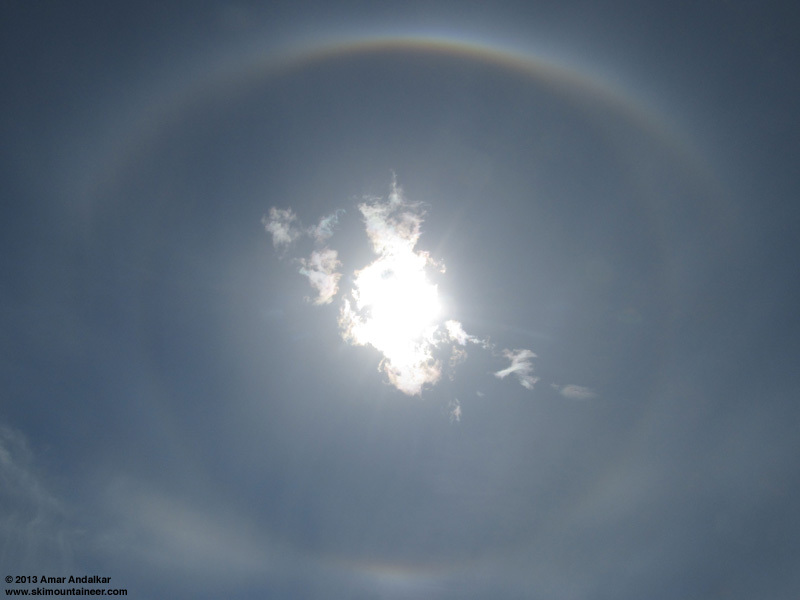 The 22� halo was joined by another halo superimposed on it, the oval-shaped circumscribed halo which is tangential to the 22� halo above and below the sun. 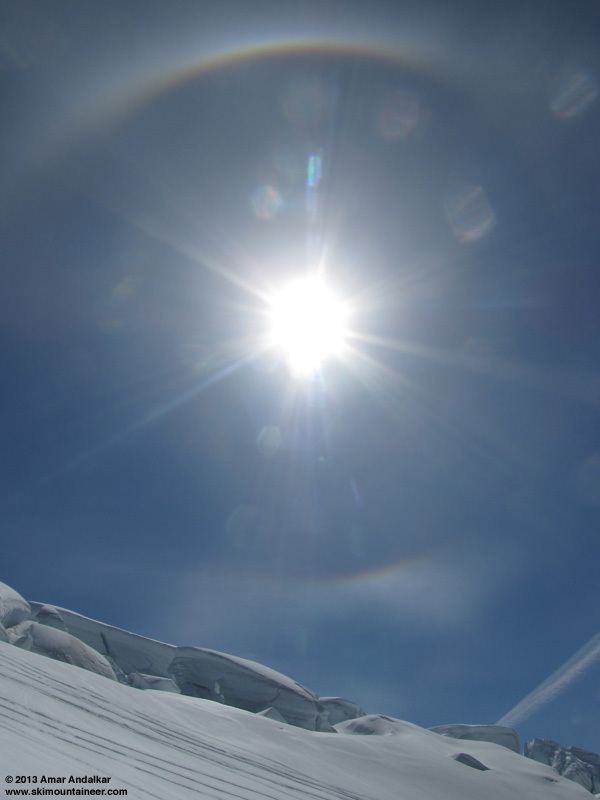 This halo changes shape radically with solar altitude, forming a true oval only when the sun is above about 50�, while separating into the bright upper and lower tangential arcs when the sun is lower in the sky (see this mouse-over graphic at http://www.atoptics.co.uk/halo/circsalt.htm). The faint 22� halo around 10am, with the much brighter upper and lower tangential arcs of the circumscribed halo superimposed on it. Solar elevation was about 45� at this time. The faint 22� halo around 11:20am, with the now almost-oval circumscribed halo superimposed on it. Solar elevation was about 57� at this time. The parhelic circle also appears to be faintly visible in this image. But the most spectacular of the day's halos began to appear around 11:45am. A few bright ribbons of blue, located well below the sun, about twice as far from it as the 22� halo. 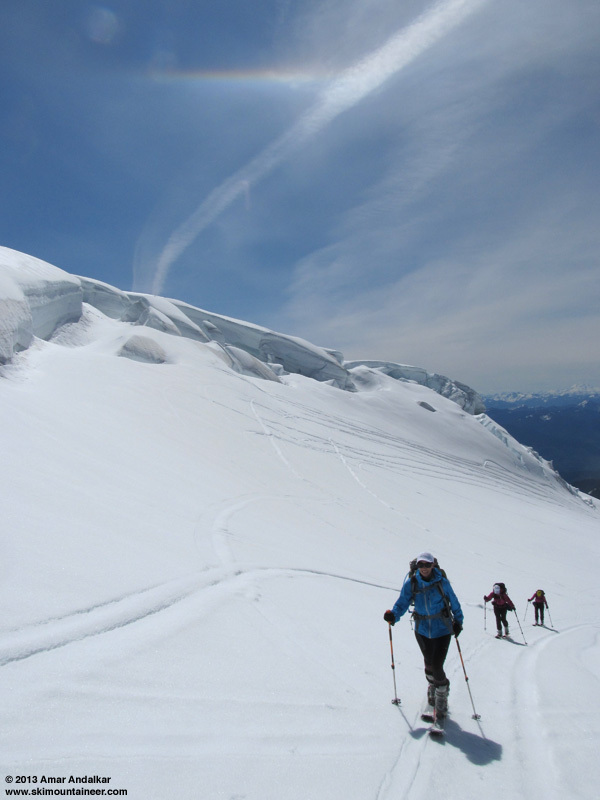 I was stunned, I've been an avid halo watcher since I began ski mountaineering 17 years ago and have never seen anything like those isolated blue ribbons. Soon the blue was joined by the other colors of the spectrum, gaining in brightness and intensity as the sun rose higher, peaking in brilliance around 12:15pm, then slowly fading later as the high clouds thickened. 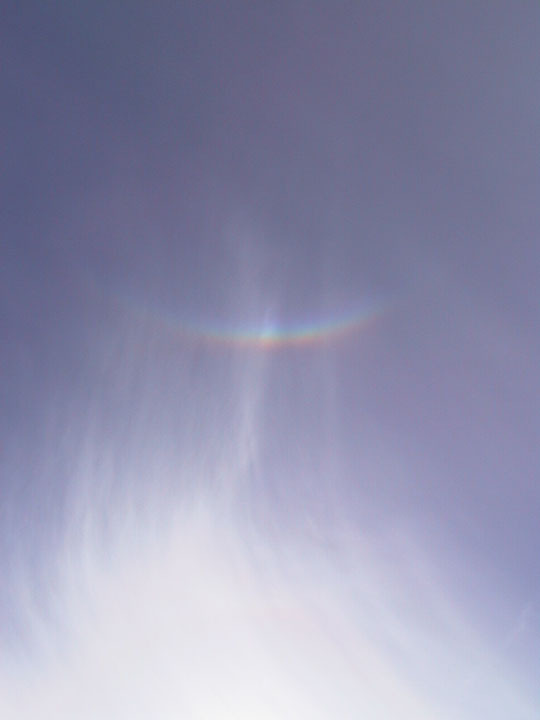 This was the circumhorizontal arc (lower symmetric 46� plate arc), certainly among the most beautiful of all the halos. 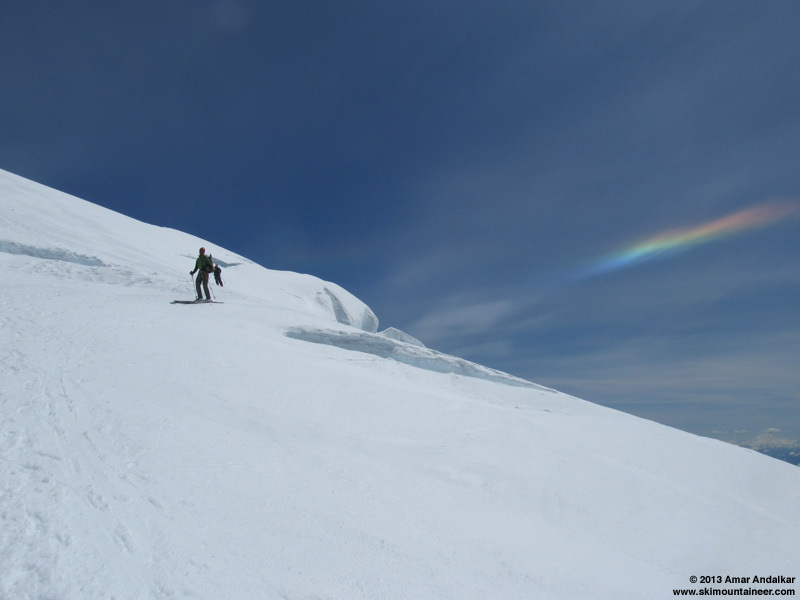 This full-spectrum circumhorizontal arc I have seen only once before that I can recall, in June 2005 while skiing Middle Sister in Oregon (see TR). Blue ribbons of the circumhorizontal arc at 11:55am, about 10 minutes after it first appeared. Solar elevation was about 60� at this time. 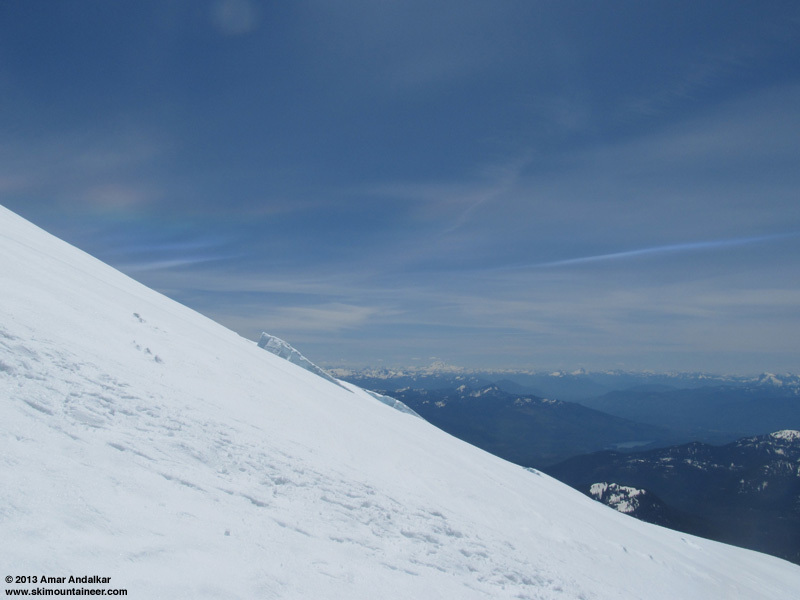 By 12:05pm, the full spectrum of colors was visible in the circumhorizontal arc, with the 22� and circumscribed halos still above it, and Glacier Peak in the distance. Solar elevation was about 62� at this time. The sun must be at least 58� high for this halo to form, so at the latitude of Mount Baker (about 49� N), this halo is quite rare and is only possible near solar noon from mid-May to late July, about 200 hours per year (see http://www.atoptics.co.uk/halo/chafreq.htm for more info). Solar noon was at 1:07pm at Mount Baker this day when the sun reached a maximum elevation of 64.5�, according to my Cascades solar calculator page. Another view at about 12:15pm. Solar elevation was about 63� at this time. 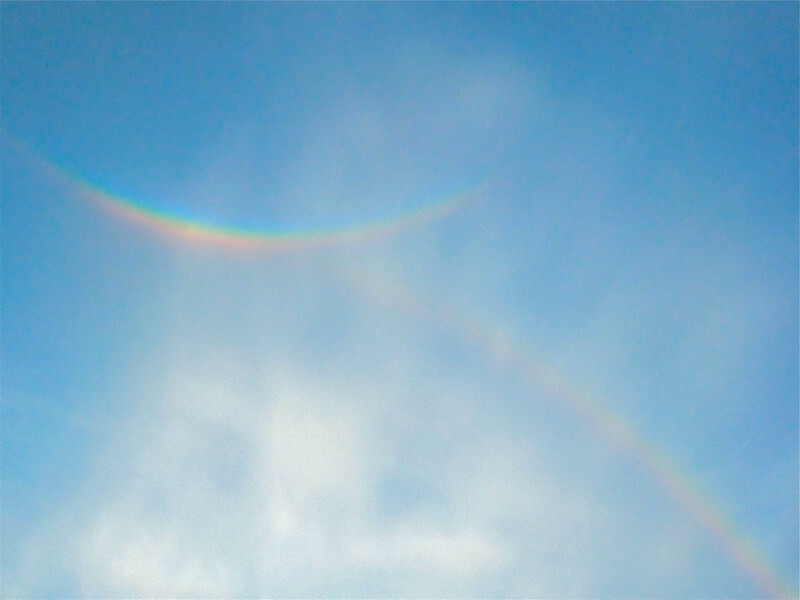 As the colorful spectacle climaxed, I realized that the sky and the cirrus might be right for other unusual halos too. I looked straight up and was stunned to see a faint colorless semicircular arc, opposite the sun and centered on the zenith (the point in the sky directly overhead). 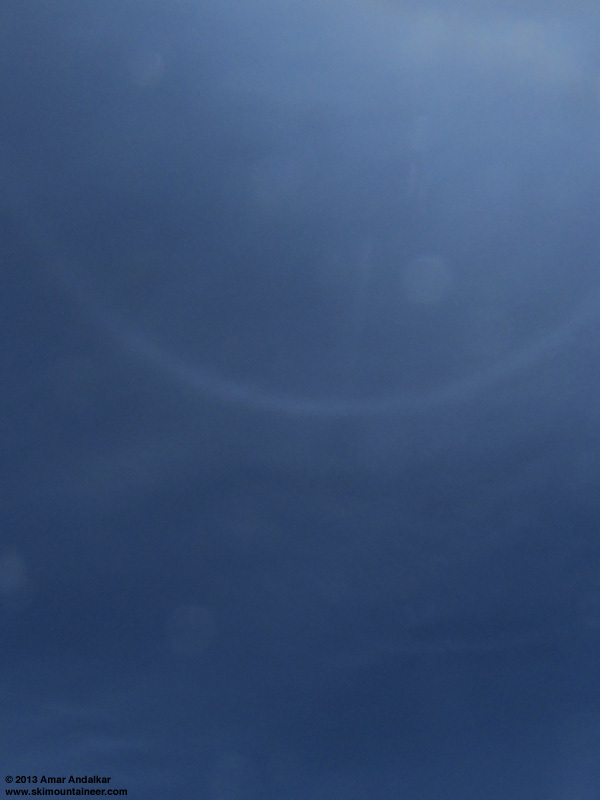 This was most likely a segment of the parhelic circle, a halo which is centered on the zenith at the same elevation as the sun, and is also uncommonly seen in this region (I don't think I've ever seen it before in this form, so high up near the zenith). Looking almost straight up at 12:15pm, with the zenith at top of image and parhelic circle visible at center. 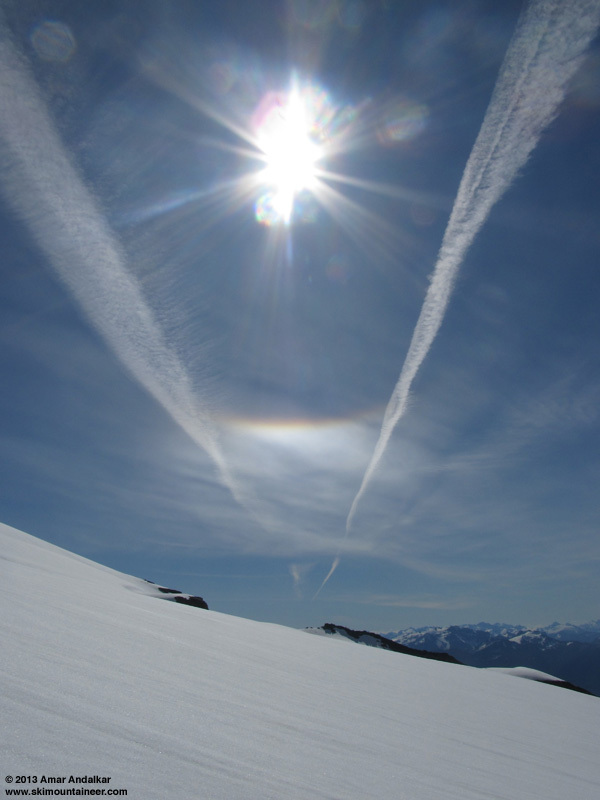 So at least 4 different types of halos were visible on this day, all caused by ice crystals in the high cirrus clouds. An awesome spectacle of nature! The Easton Glacier route is in typically good shape, with excellent deep snow coverage and minimal crevasse hazard, just a few areas of obvious sags and crevasses from about 7500 ft up to 9400 ft. We brought glacier gear and wore our harnesses from 7500 ft on up, but never felt the need to rope up. As usual, the current bootpack crosses a bunch of obvious sags and hazards (which may have developed since it was put in place), with safer terrain just a few yards off to one or the other side. However, most parties (ascending and descending) continued to blindly and needlessly cross the sagging bridges and dips instead of doing some active routefinding and properly end-running these hazards. Sad to see that, along with the jaw-dropping glacier travel practices of some parties (e.g. two-person teams, roped together by the entire rope, doubled over and studded with numerous butterfly-looking knots, walking side by side about 5 ft apart, with the rope dragging behind them in a long U-shaped loop -- saw two separate pairs travelling that way, wtf!?!? after 12 years of teaching crevasse rescue on skis, it's still nice to learn something completely new out on the Easton Glacier!). It was good to see at least a few parties actually paying attention and rerouting around the hazards. Frankly, it's safer to travel unroped on skis while routefinding around obvious crevasse hazards, than to be roped up and proceed blindly along a previous track which crosses directly over numerous dips and sagging snow bridges, greatly increasing the risk of punching through and falling in. Looking up the Easton route from roughly 8000 ft. The snow on the Easton route (which is now actually entirely on the Deming Glacier above about 7500 ft) was near perfect for skinning, grippy sandpaper-like corn softened just enough by mid-morning. A cool breeze kept things from ever getting uncomfortably hot. 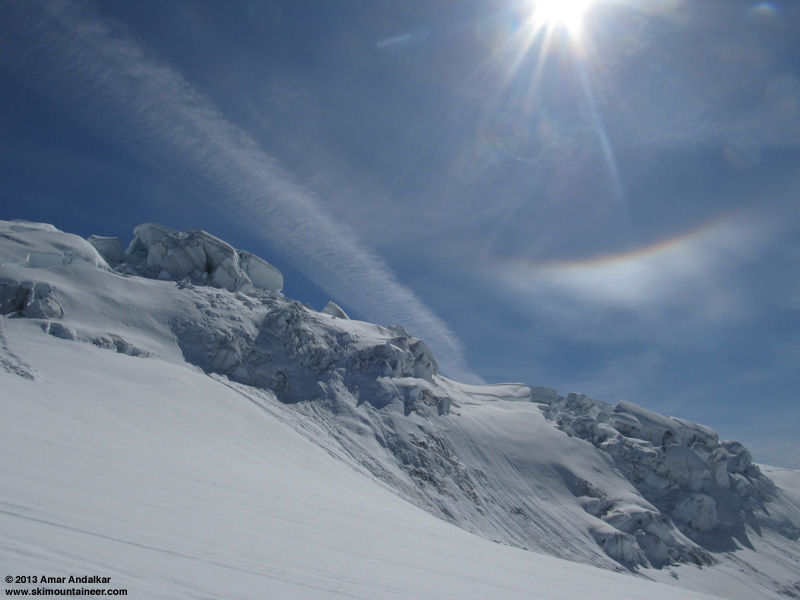 The crux of the route is a narrow section which weaves between open crevasses on both sides near 9200 ft.
Skiers descending through the crux area near 9200 ft, with the colorful circumhorizontal arc still visible. We took a long break just below the 9720 ft saddle on the rim of Sherman Crater, staying just beneath the intense windblown odor of sulfurous gases. The Roman Wall has a few incipient cracks above 9900 ft, but a decent bootpack was in place which avoided most of the hazard. 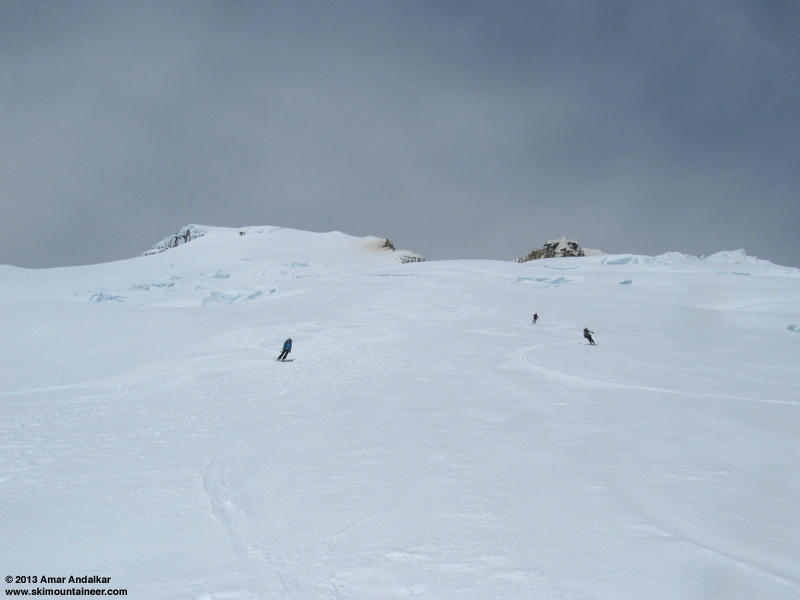 My three partners decided to boot, but the skinning conditions seemed good and I decided to put in a skin track instead, switchbacking up the steep 35� face. I used ski crampons just in case the slope became too firm for safety, but they were not needed and actually made the sun-warmed snow glop much worse onto my skins. Nevertheless the skinning went fine with no slips at all despite that impediment. Time to clean the skins at 10600 ft atop the Roman Wall at the edge of the summit dome. We arrived atop the true summit of Grant Peak just after 2pm, as several large groups of skiers and climbers were just departing. The breeze on the summit dome and atop the peak was quite chilly, a bit stronger than expected at S 20-30 mph with an air temperature just below freezing. Luckily there was a small area on the north slope of Grant Peak that was mostly sheltered from the wind and fairly comfortable to hang out in. We skied down just before 3pm, leaving a pair of very stoned skiers behind on the summit (they had come up the Boulder -- or was it the Park, duuuuude? 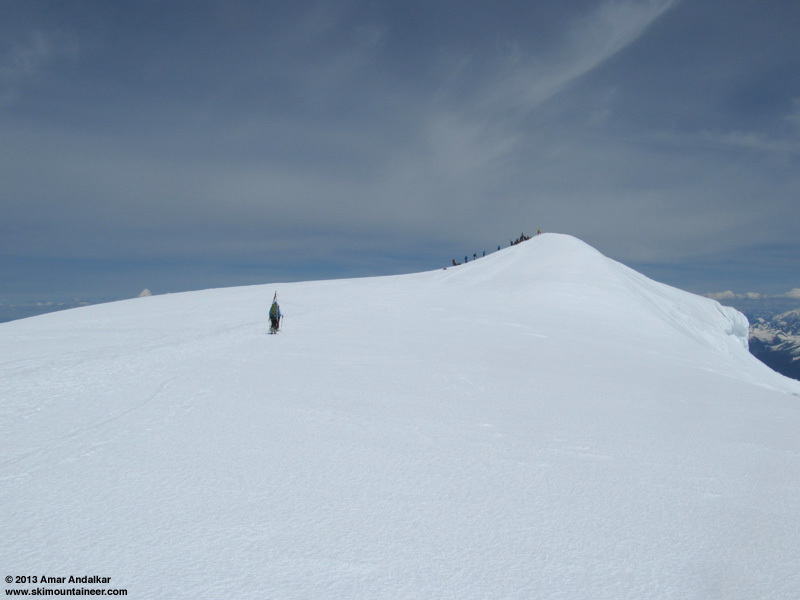 they didn't seem to know), and exchanged greetings with another large party of 7 skiers just arriving across the summit dome, most of whom we knew. 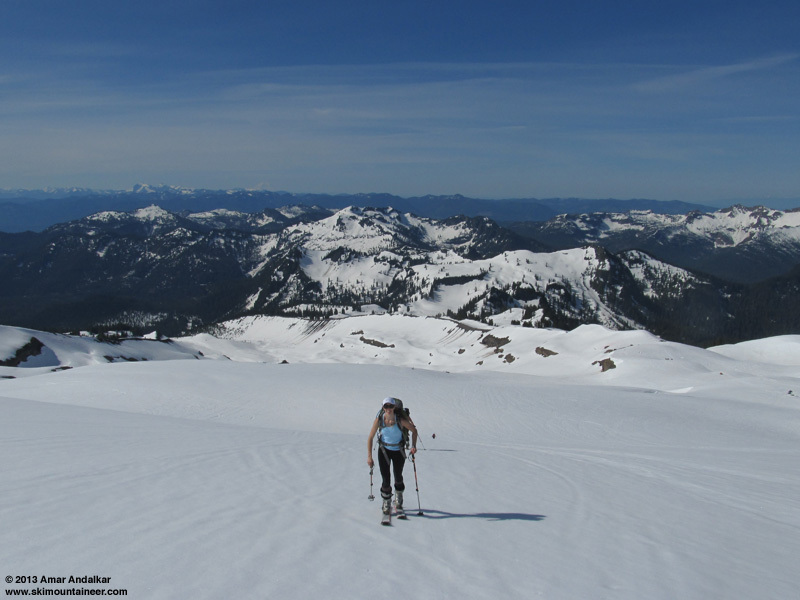 We traversed the edge of the summit dome in a gentle downhill arc, fighting the headwind but avoiding any reascent, and dropped onto the still somewhat-firm Roman Wall. But within a few turns as the slope rolled steeper, more sunlight and less wind had softened the corn to near perfection. Smooth, fast, awesome turns down the entire face, and continuing on excellent smooth corn down to around 7500 ft. The thick high clouds made the light really flat as we skied the Roman Wall, so no good skiing photos there. This one is from lower down closer to 8000 ft, with some sweet corn turns. Eventually as we dropped lower, the snow was bound to become overcooked as it was now almost 4pm. It was definitely sticky in spots, but not deep mush yet anywhere, the thick surface crust remained supportive on skis even as we watched ascending late-day climbers postholing deeply. A final view of the 22� and circumscribed halos around 4pm, as a small cumulus cloud obscured the sun. Solar elevation was about 47� at this time. We made sure to drop into the gully east of the main Rocky Creek drainage near 4200 ft, hoping the snow would remain continuous, and it did. We followed an old snowmobile track down the gully, making sure to avoid a few thin sections above the small stream, and eventually connected back to the standard trail near 3600 ft. 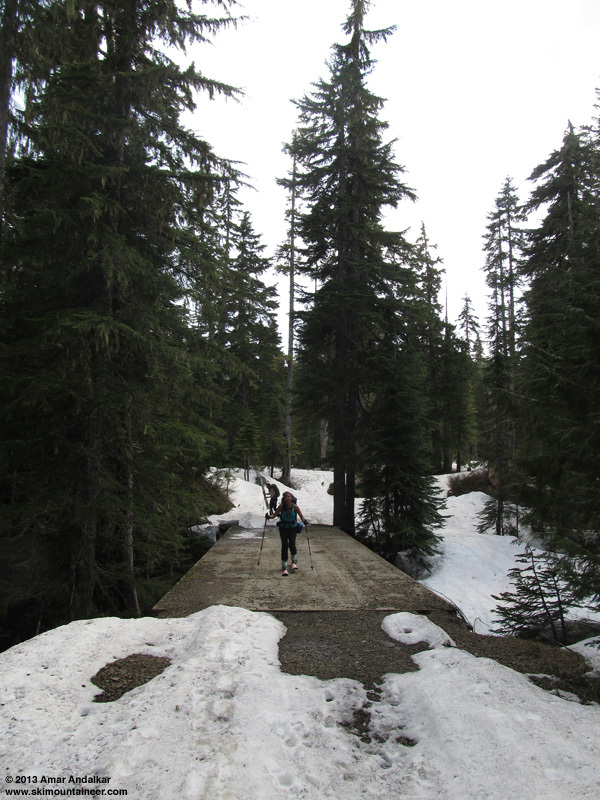 This was slow, sticky, pollen-covered snow, but it was totally continuous all the way down to the snowmobile bridge below the trailhead. 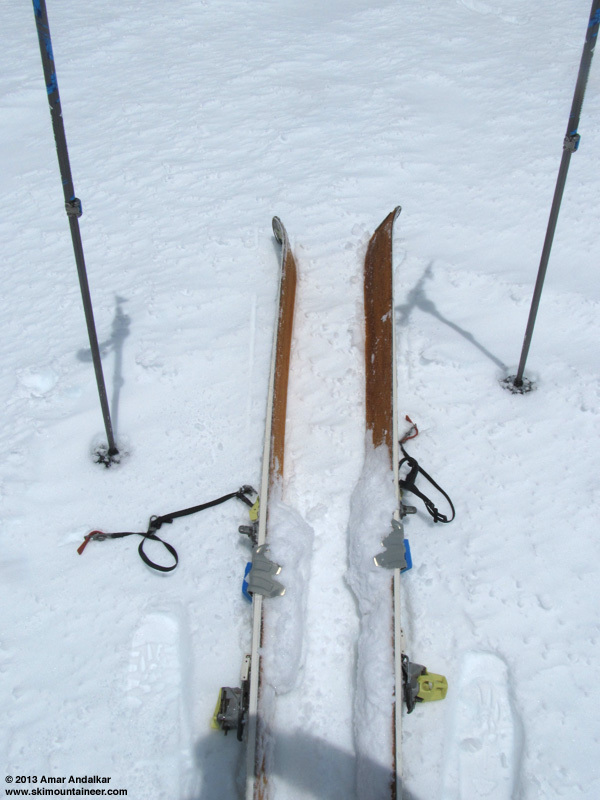 Some of us even kept our skis on for that and detoured the short bare patch in the road through the woods, thus skiing continuously all the way from the summit of Mount Baker to the bumper of the car by 5pm. An outstanding day with excellent company, fine snow conditions, and amazing optical phenomena, as the Great White Watcher delivered once again with 7500 vert of continuous skiing in mid-June from the summit down to the trailhead and below. That's a lot of halos! Thanks� for the good report. My partner and I were over on the Park-Boulder cleaver and noticed a lot of the same interesting things going on with the sun. I didn't know what I was looking at, but it was definitely a spectacle. Looks like it's time to edumicate myself on some solar sciences. Cool TR. The arc was also visible from the northeast side of Mt. Baker where our group was skiing. Wow. My partner and I were looking at the "rainbows" in the sky but I had no idea! I very much wish I knew about the gully east of the Rocky Creek drainage. We took different ways on the up and down but had to do stream crossings and carry for a while over the rocks either way. Good seeing you Amar on the summit dome! Always a pleasure to run into you and company on the mountain. Glad to read you were able to find a continuous ski back to the car, I would have expected nothing less! Just looks like a bunch of UFO's to me. Judging from the time of your descent, i think I watched you guys ski down the upper Easton from my perch on the summit of Lincoln. Sigh. Way to rub it in. Nicely done, Amar. Thank you for posting about solar halos; I definitely learned something (as per usual) from an Amar Andalkar TR. 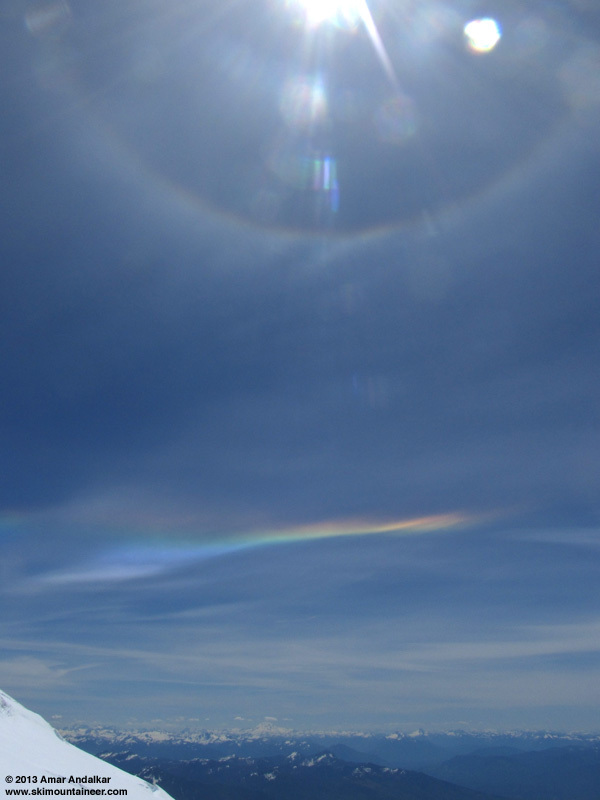 From Muir Camp on Rainier on Saturday I also noticed the 22* halo as well as the circumhorizontal arc, although like Paulina referred to them as 'rainbows in the sky' having no idea what I was actually looking at. Very informative TR. great to learn something new! Thanks for the TR and all the info on halos. Here is a photo of a tangential pair later that day, looking high in the sky west over Puget Sound from Seattle at about 7 pm, so one may have been at the zenith and the other at 22 degrees?� What do you think?� �Amazing displays of sun dogs, halos til sundown. Here is a photo of a tangential pair later that day, looking high in the sky west over Puget Sound from Seattle at about 7 pm, so one may have been at the zenith and the other at 22 degrees? Don, the upper halo certainly looks like the circumzenithal arc, which appears high in the sky near the zenith, but can only occur when the sun is low in the sky (see diagram at http://www.atoptics.co.uk/halo/czasalt.htm). The solar elevation at 7pm was about 20�, nearly optimal for producing a bright circumzenithal arc. Quite a display that day! 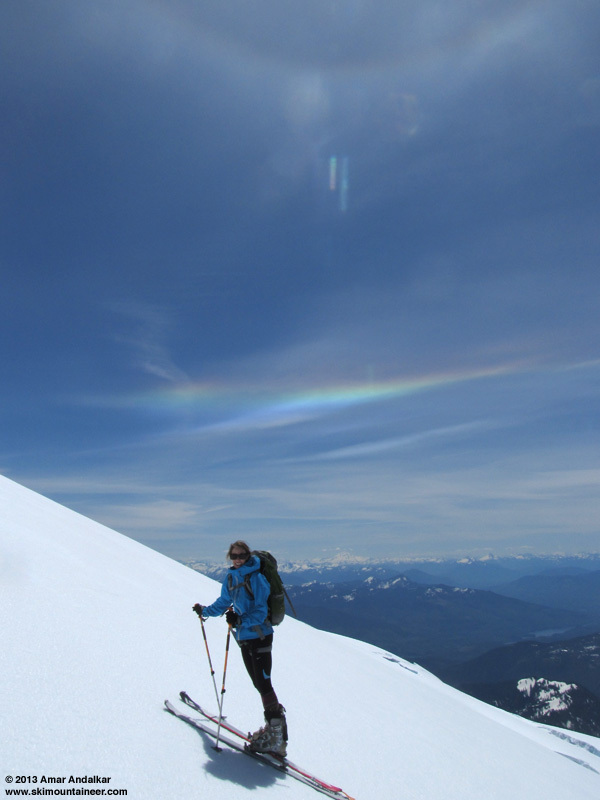 The luckiest experience I've had was skiing through a rainbow (at least it felt like we went all the way through) in the Cascades one spring day. It's a form of pollution. Permanent contrails. The thick lines in your photos formed behind airplanes, correct? The thick lines spread and turned into a haze of flat light. I dig the positive outlook thought. I think I've seen that happen, but it was not contrails in this case. There were cirrus clouds across the sky that day.